Bank Of America: "Powell Has Boxed Himself Into A Corner"
A little under a month ago we explained why, with the Fed Chair having capitulated to the market, pausing the tightening cycle and with rate cuts now imminent even as inflation continued to rise, "Powell May Not Know It Yet, But The Fed Is Now Trapped." The abruptness of Chair Powell's policy U-turn did not help the Fed's credibility (some have argued it's the largest shift in Fed policy intentions in history absent a market shock), and the Fed will have an uphill battle in communicating a hike if so intended. In this sense, Powell seems to have boxed himself into a corner, compared to either Yellen or Bernanke, whose high market sensitivity and complete policy flexibility (with inflation risks far in the distance) helped create the low vol bubble. And speaking of the low vol bubble, Bank of America highlights something that Morgan Stanley first observed last October, namely that the "Buy The Dip" strategy is dead, and writes that "central banks' unprecedented policy created the low vol bubble through multiple channels, including direct purchase of risk assets, incentivizing investors to sell volatility for yield by keeping rates low, encouraging share buybacks through easy debt financing, but most importantly their verbal (at minimum) support for financial markets during periods of stress." It does not take rocket science then to infer that Powell's recent shift from insensitivity to caring about financial markets is vol negative, and could help the VIX now average lower than in 2018 absent external shocks, according to BofA which further adds that "this could take our 2019 estimate for the average level of the VIX from the mid to high teens back toward the low to mid teens." 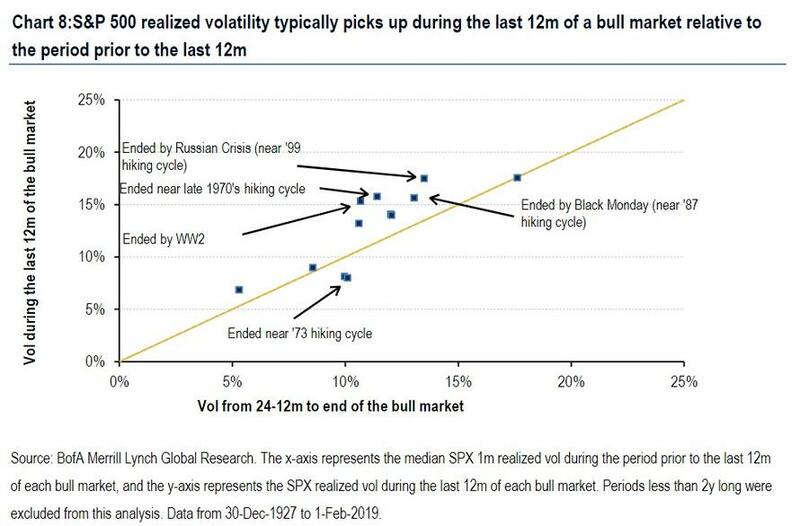 However, not even Powell's dovish capitulation according to BofA will be sufficient to recreate the low vol bubble of 2017, in which the VIX averaged 11, for one reason the 2017 bubble was extreme, and took years of Pavlovian conditioning. The DJIA traded in its tightest trading range in 110 years in 2017, driven by years of conditioning which induced a Pavlovian market response to buy every dip. This learned response function took time to develop (it became progressively stronger from 2013-2017), and isn't likely to be re-established quickly even with the Fed's change of tack. Fed policy is inherently more uncertain today: With unemployment near 50-year lows, and with the Fed intent on further policy normalization prior to the recent market weakness, the risk is that strength in the real economy (and stronger markets) pushes the Fed to hike again this year, something we noted yesterday. Not surprisingly, BofA continues to call for 2 hikes in 2019 (most likely in the second half), and reminds its clients that "inflation is the real killer of low vol as it severely handcuffs central banks from being able to support markets." While inflation isn't constraining the Fed yet, it's much more of a risk at this stage of the cycle than it was several years ago. With Fed policy now seemingly adrift, and at the mercy of what the data delivers, "the risks of further abrupt policy shifts are higher than before" according to BofA. Cash is now a real alternative: The simple fact that rates are higher today and cash is a viable asset (best performer in 2018) means appetite for riskier short vol strategies will continue to wane, according to BofA's Benjamin Bowler. Recall that 2018 was the worst year for simple S&P vol risk premia strategies in 30 years, and with many traders having gotten burned selling vol, it will be an uphill climb for this behavior to return at a systematic degree. Hence, BofA concludes that simply the lagged effect of higher rates should continue to support volatility as shown in Chart 7. A more conventional reason why BofA believes vol is set to increase over the year, a dovish Fed notwithstanding: namely, that 90 years of data shows late-cycle equity markets are vol supportive: Since 1928, looking at the S&P in phases of bull and bear markets shows that vol tends to rise in the later stages of a bull market. With most admitting the US economy is late cycle and with earnings beginning to deteriorate (as we reported, Q1 will see the first EPS decline Y/Y in three years), rising fundamental risks may also support volatility from here. There is another reason why it is too early to bet on single digit vol, the first being that if the next move is a cut in rates, traders will intuitively expect higher vol for a simple reason: "what does the Fed know that we don't." Indeed, given the Fed's abrupt U-turn in policy intentions despite what they admit is still strong economic data, the hurdle for the Fed to cut rates is also likely high. This suggests it would take a significant deterioration in the economy or much weaker financial markets to push the Fed to cut, both of which likely would be led by higher market volatility. The last reason why Powell is trapped, is that with only 225bps of ammunition, tail risks are also rising. 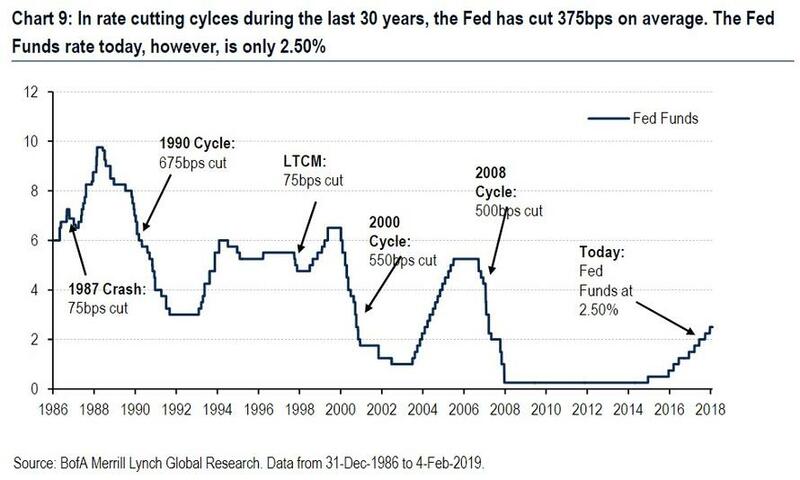 The inability for the Fed to raise rates further leaves them shy of the historically needed ammunition to stave off a shock (the average Fed rate cut since 1987 has been 375bps with much larger cuts common in bigger economic downturns). The Fed is also the only major CB with traditional ammunition, leaving the global policy tool chest quite bare. In other words, if the probability of a rate cut rises from here due to deteriorating conditions, markets may start to fear this increasingly precarious position. Luckily (for the Fed), just yesterday we showed that the San Fran Fed was setting the ground for not only QE (as the ECB did a few days earlier), but also Negative Rates, after a "researcher" there published a report "How Much Could Negative Rates Have Helped the Recovery?" and found that the answer is "a lot", greenlighting the Fed chairman to cut rates as negative as needed, and effectively allow Powell to escape the trap he finds himselfin right now.